An elevated floor, or a balcony, in the interior of a church, synagogue, or other large building, resting on columns, and surrounded by a balustrade. In the Orthodox synagogues it is reserved for women; for the modern usage see Frauenschul. The Temple had galleries in the shape of winged or bay chambers, variously described as "ẓela'," "gizrah" or "attiḳ" (attic), and "'aliyyah" (I Kings vi. 5; Ezek, xli. 13-15; I Chron. xxviii. 11). But these, it appears, were either private chambers or passages, or merely architectural ornamentation. A gallery used for public gatherings was constructed in the women's apartment ("'ezrat nashim") in the Temple for the libation celebration at Sukkot. The Mishnah relates that "On the eve following the first day of the festival they went down fifteen steps to the women's 'azarah, and prepared a great improvement" (Suk. 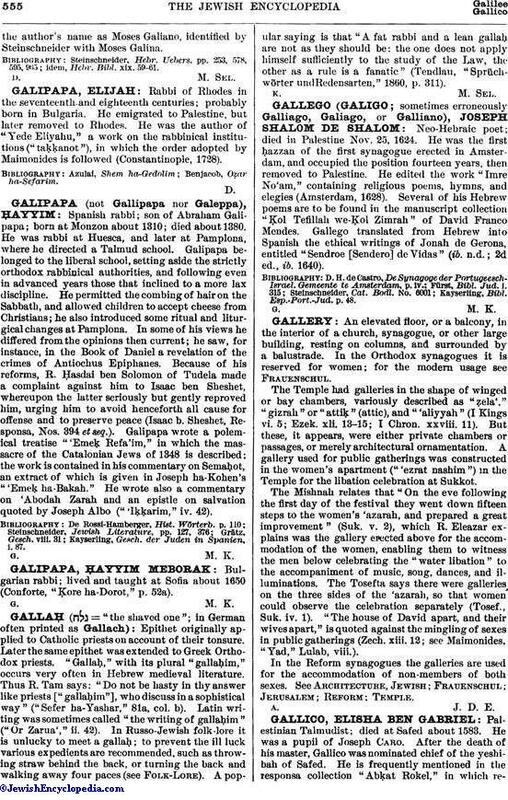 v. 2), which R. Eleazar explains was the gallery erected above for the accommodation of the women, enabling them to witness the men below celebrating the "water libation" to the accompaniment of music, song, dances, and illuminations. The Tosefta says there were galleries on the three sides of the 'azarah, so that women could observe the celebration separately (Tosef., Suk. iv. 1). "The house of David apart, and their wives apart," is quoted against the mingling of sexes in public gatherings (Zech. xiii. 12; see Maimonides, "Yad," Lulab, viii.). In the Reform synagogues the galleries are used for the accommodation of non-members of both sexes. See Architecture, Jewish; Frauenschul; Jerusalem; Reform; Temple.